Vancouver today is recognized as one of the most livable cities in the world as well as an international model for sustainability and urbanism. Single-family homes in this city are "a dying breed." Most people live in the various low-rise and high-rise urban alternatives throughout the metropolitan area.The Death and Life of the Single-Family House explains how residents in Vancouver attempt to make themselves at home without a house. Local sociologist Nathanael Lauster has painstakingly studied the city's dramatic transformation to curb sprawl. 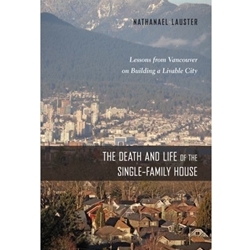 He tracks the history of housing and interviews residents about the cultural importance of the house as well as the urban problems it once appeared to solve.Although Vancouver's built environment is unique, Lauster argues that it was never predestined by geography or demography. Instead, regulatory transformations enabled the city to renovate, build over, and build around the house. Moreover, he insists, there are lessons here for the rest of North America. We can start building our cities differently, and without sacrificing their livability.